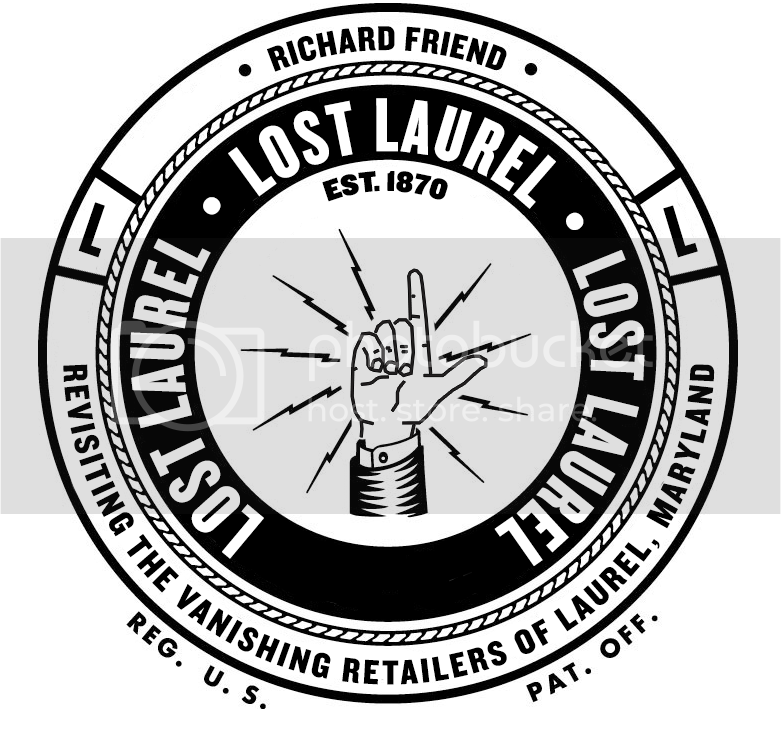 Long before Laurel’s labyrinthine Home Depot—and even Hechinger—there was a small hardware store on Main Street that seemed to carry everything. Just as importantly, they knew were everything was. Perhaps, like me, you weren’t particularly handy with power tools (growing up in an apartment complex like Steward Manor with a highly-capable maintenance team can have that effect, you know.) 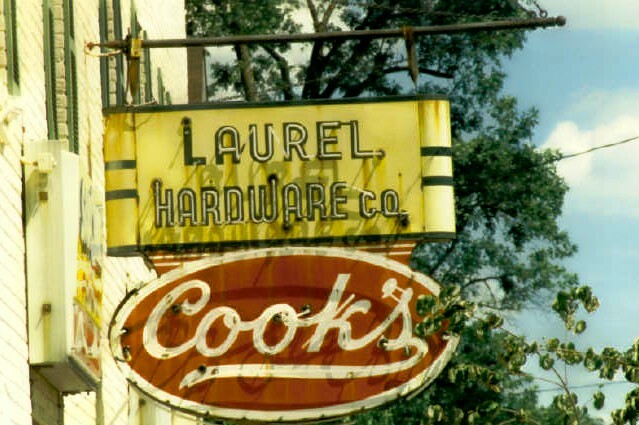 But even if you’d never ventured inside Cook’s Laurel Hardware Company, chances are you remember seeing their iconic neon sign—a throwback to their 1938 origins—every time you passed by. 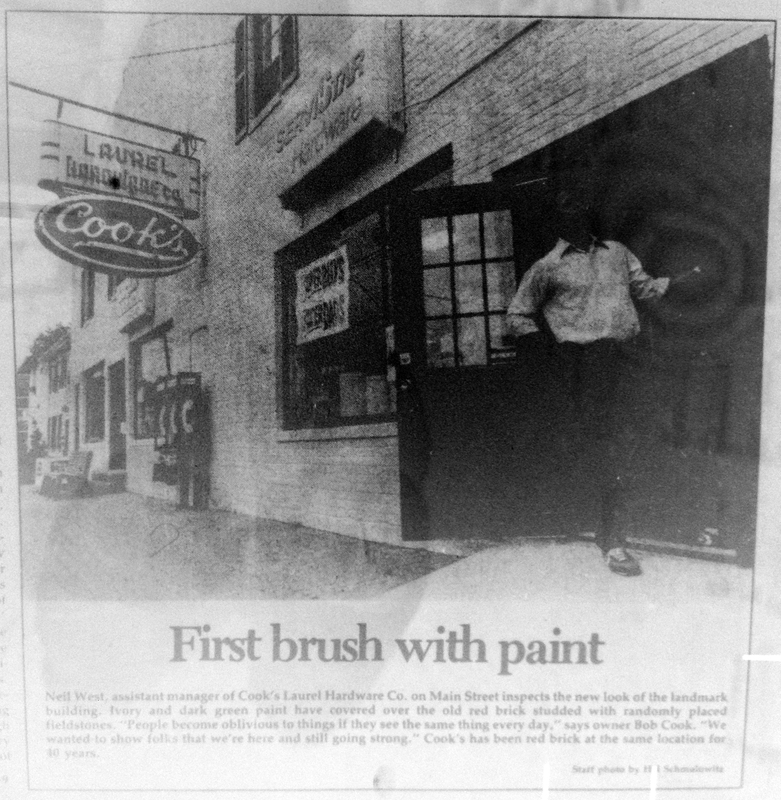 If you did go inside, chances are you remember the creaky wooden floors, patched together with metal flashing—also a testament to Cook’s 59 years of service to Laurel. 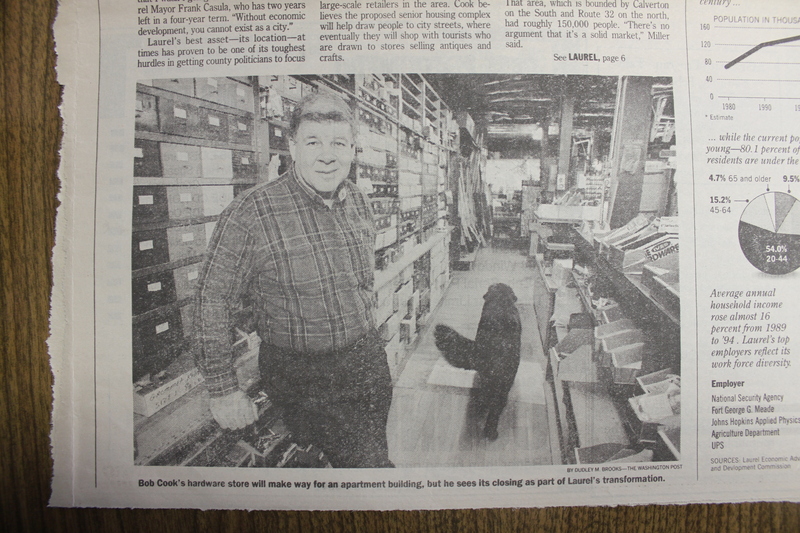 Former customers of all ages fondly recall visits with parents, grandparents… and even dogs, which were welcomed inside. 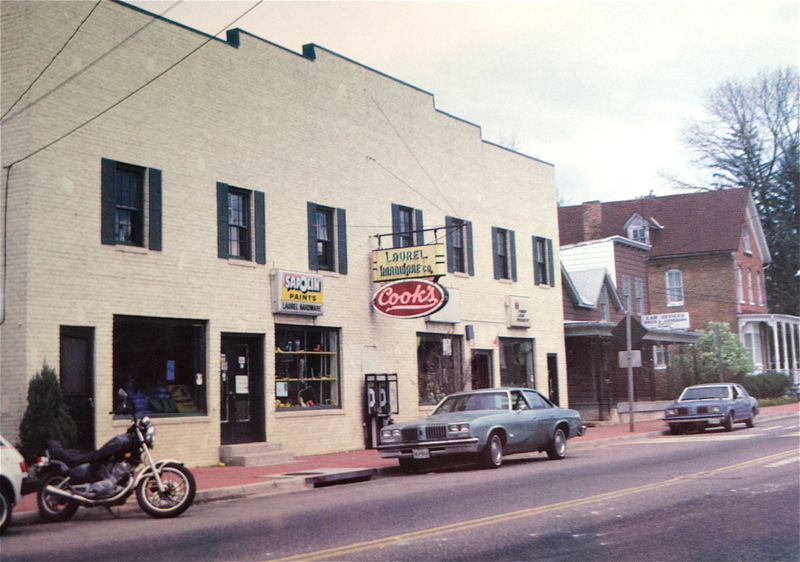 For most of its long tenure on Main Street, the store was identifiable by that distinctive neon sign at least as much as its red brick exterior. Until 1983, however, when the store’s facade underwent a dramatic makeover—ivory and dark green paint brought new life to the Main Street classic. But by the mid-1990s, Laurel was in full transition mode—adapting to the arrival of discount retailers such as Walmart, Sam’s Club, Target, Kohl’s, and The Sports Authority, among others. Main Street’s small shopkeepers struggled to secure their niche market amid the flurry of large-scale retailers. And ironically, it wasn’t the big box stores that ultimately doomed Cook’s—not completely, anyway. Technically, it was old people. 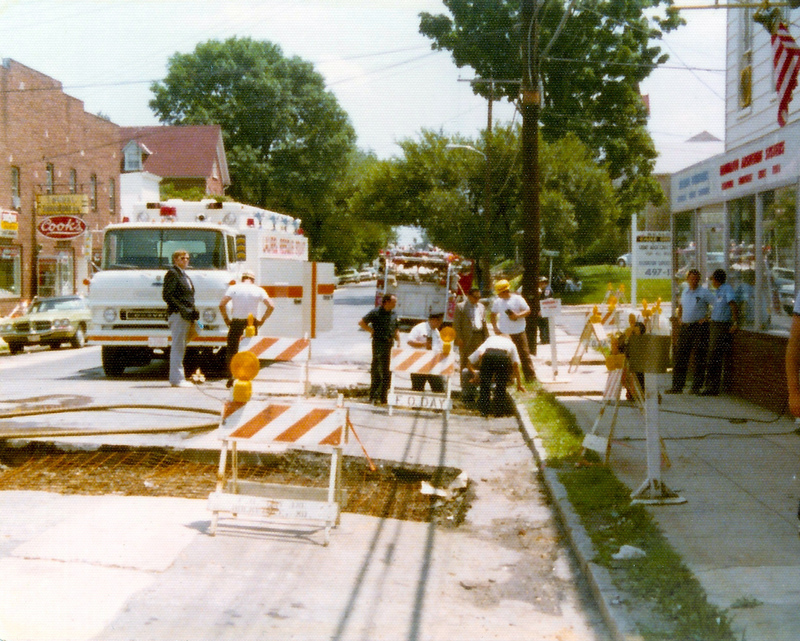 Upon closing in the summer of 1997, the building was razed to make room for a 124-unit apartment building for senior citizens—Selbourn House. While he laments the store’s closing, Cook views it as part of the transformation begun three years ago by Laurel’s government and business leaders to boost employment, spur economic development and make the most of Laurel’s location, halfway between Baltimore and the District. Cook believes the proposed senior housing complex will help draw people to city streets, where eventually they will shop with tourists who are drawn to stores selling antiques and crafts. 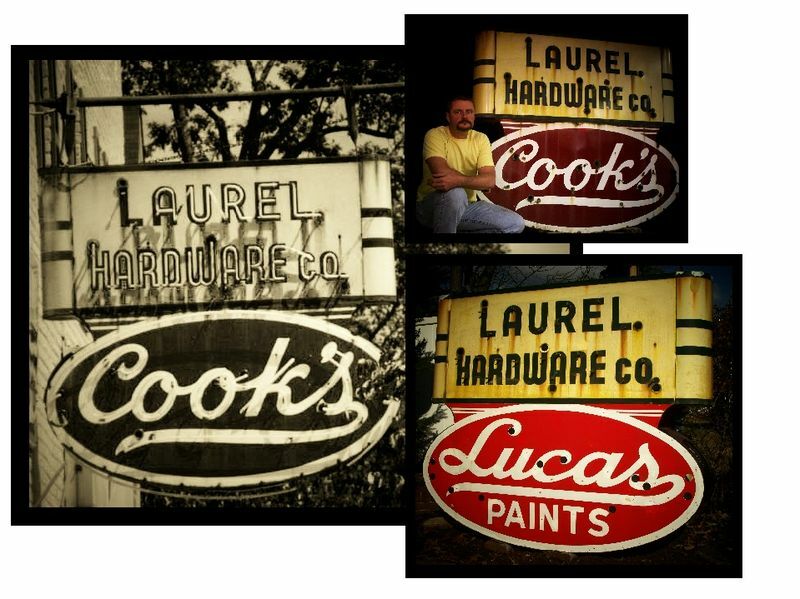 Cook’s Laurel Hardware Company has been gone now for some 15 years, but in many ways, it lives on—and not just in memories. Norman James, Jr. is an accomplished sign maker whose passion is in documenting, rescuing, and restoring classic neon signs of the Baltimore/Washington area. He then showcases the old beauties he’s rescued (as well as some that he couldn’t) on his website, often with fantastic historical notes that may have otherwise been lost to the ages. Norm lost his bid to procure the Cook’s sign in 1997; and for the next 11 years, it sat in the coffee shop just across the street from the old hardware store itself. But, fast-forward to 2008—and the coffee shop itself was closing. Better late than never, Norm was more than willing to once again give the 400-pound, 6′ x 6′ sign a good home. You’ll often hear folks talk about the experience of walking through a mom & pop hardware store, and its ambiance: the smell of cut plywood and 2 x 4s; the close proximity of shelves full of nails, drywall screws, and countless other fasteners; the sound of a paint mixer. Nowhere was that experience more appreciable than Cook’s. Sure, Home Depot probably has everything and then some; but sometimes, what a customer really wants is the chance to browse at his or her own pace in a welcoming environment. Preferably one with an old, creaky wooden floor. I grew up in Hammond Village, and we went to Cook’s quite a bit. “Labyrinthine” doen’t even begin to describe the rat’s warren of little tables and counters and other displays, plus the whole upstairs area. My dad said that old Mr. Cook used to buy a couple extra of anything anyone special ordered, and he knew where it was all squirreled away. so oftentimes you’d find yourself trailing behind him on the way to some corner or another where he’d pull out a box he had gotten some years back.